After growing up in Pennsylvania and graduating from Bucknell University in 2010, John enrolled in the Peace Corps Master’s International Program at the University of South Florida. 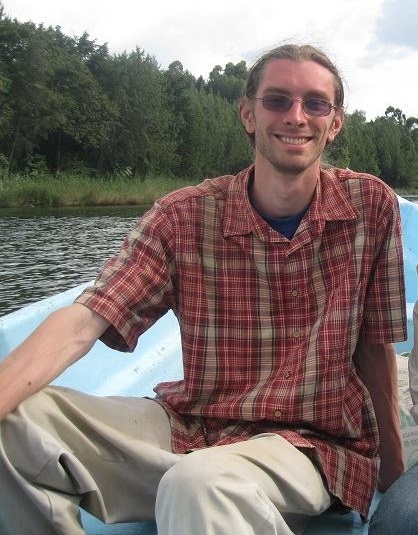 As a Peace Corps Volunteer, John lived in southern Uganda for three years and worked with a local organization called Brick by Brick Uganda, which focused on water and sanitation, economic development, and improving school infrastructure in local communities. While there, John also conducted research on social and technical aspects of urine-diverting dry toilets for his Master’s thesis: "Ecological Sanitation in Uganda: Promotion through Demonstration Facilities and Potential for Ascaris Reduction by Free Ammonia Inactivation Using Stored Urine". This type of research eventually led him to where he is now, working as a PhD student in the Guest Research Group at the University of Illinois at Urbana-Champaign. John is currently working to quantify the potential global impacts of nutrient and energy recovery from sanitation systems and thinking about how these systems might be made more economical, efficient, and appropriate in resource-limited settings. When John isn’t at work, you might find him composing and playing music, writing poetry, or taking a long bike ride. Trimmer, J.T. ; Nakyanjo, N.; Ssekubugu, R.; Sklar, M.; Mihelcic, J.R.; Ergas, S.J. (2016). Estimation of Ascaris lumbricoides egg inactivation by free ammonia treatment of ash-amended UDDT vault products using stored urine in Uganda. Journal of Water Sanitation and Hygiene for Development, 6(2), 259-268. Trimmer, J.T. ; Nakyanjo, N.; Ssekubugu, R.; Sklar, M.; Mihelcic, J.R.; Ergas, S.J. (2016). Assessing the promotion of urine-diverting dry toilets through school-based demonstration facilities in Kalisizo, Uganda. Journal of Water Sanitation and Hygiene for Development, 6(2), 276-286. Kinyua, M.N. ; Trimmer, J.; Izurieta, R.; Cunningham, J.; Ergas, S.J. (2016). Viability and fate of Cryptosporidium parvum and Giardia lamblia in tubular anaerobic digesters. Science of the Total Environment, 554, 167-177. Halfhide, T.; Dalrymple, O.K. ; Wilkie, A.C.; Trimmer, J.; Gillie, B.; Udom, I.; Zhang, Q.; Ergas, S.J. (2015). Growth of an indigenous algal consortium on anaerobically digested municipal sludge centrate: photobioreactor performance and modeling. Bioenergy Research, 8(1):249-258.